Can Someone Please Help Me Find My Cell Phone? A cell phone is a necessity. Some people would even say that they can’t live a day without their cell phones. It is not only for making calls to family members, friends and business associates. It has become a link to the Internet, a tool to capture memories through photos and videos or a gadget to play music. It stores tons of information about you and the people you are associated with. So what happens when your beloved cell phone goes missing? You know you just misplaced. Where? You’re not sure. How do you find it? 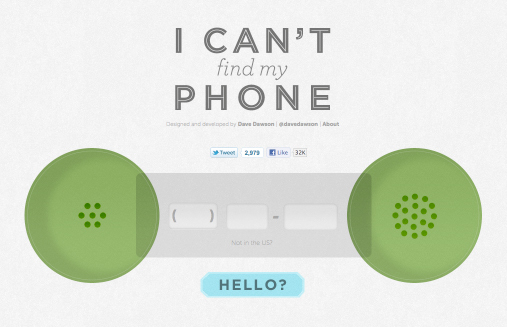 You go to I Can’t Find My Phone, a side project of Dave Dawson from New York City. It’s mission is straightforward: to help people find their photo when misplaced. Simply enter the phone number and you should hear your phone ring.